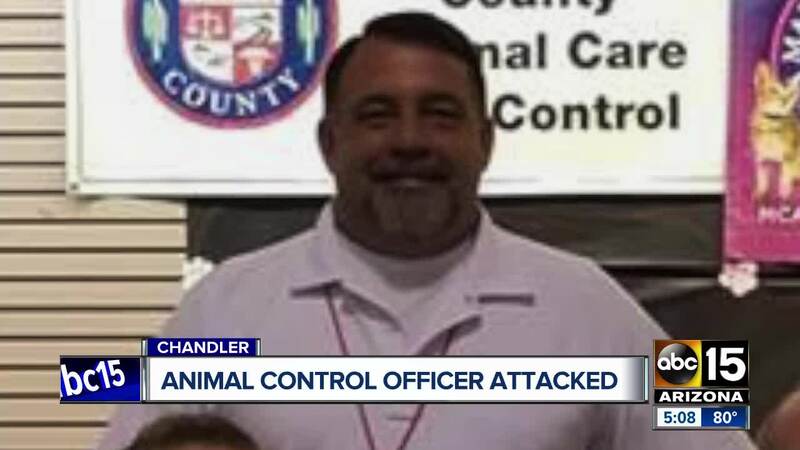 ABC15's Jamie Warren has the latest details after an animal control officer was attacked by a dog in Chandler. Officers shot and killed the dog. Police shot and killed a Rottweiler at a Chandler home after the dog attacked and seriously injured an animal control worker. Maricopa County Animal Care and Control spokesman Jose Santiago said officer Rick Alva responded to the residence near Warner Road and Arizona Avenue on Wednesday morning to impound "Rocky" per court order. Alva and Chandler police officers arrived at the property and contacted Rocky's owner, who reportedly opened the door, but according to witnesses "made no effort to restrain the dog." Santiago said Alva was bitten in the right forearm, and after that bite the dog initially released its grip. Alva was unable to get away at that point and was bitten a second time in the same area of his forearm. The rottweiler refused to let go, which prompted the Chandler officers escorting Alva to open fire on the dog, killing the animal. Santiago said Alva was admitted to the Chandler Regional Hospital in stable condition, but will be undergoing surgery due to his injuries. MCACC has reportedly filed charges of aggressive dog and dog at large, both misdemeanors, against Rocky's owner. The department is also asking police to investigate a felony charge of assault. Santiago said this is not the first time the Rottweiler has attacked someone. In June 2017, Rocky bit someone while loose and the victim had to be treated for their injuries. In February 2018, the dog was taken to a mobile veterinary clinic where he bit a technician twice. As recently as September 2018, the dog was brought to a nursing home, where he attacked a resident who later needed to be hospitalized for treatment. That September incident prompted courts to order a November 13 hearing, which is why Alva was at the home Wednesday to impound the dog. 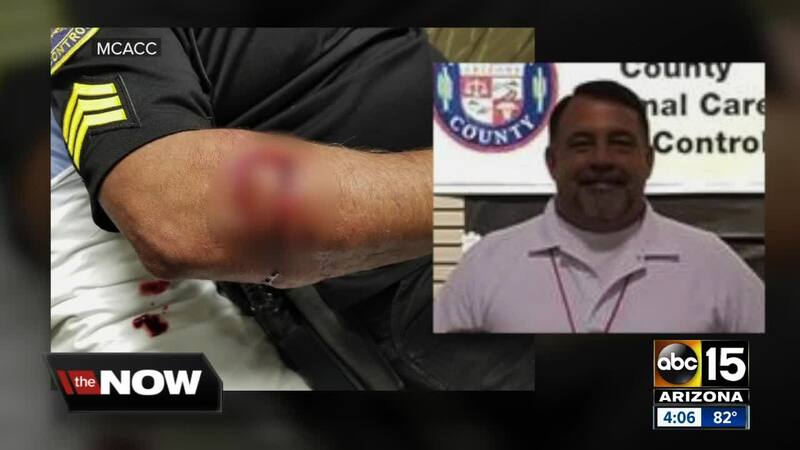 Alva's injuries are reportedly "quite extensive", and Santiago said the incident is a "tremendous loss" to their agency, as Alva is a 20-year veteran of the department. Santiago said had the dog been properly restrained, the attack could have been prevented. Santiago said Rocky’s remains are being tested by the state lab for rabies.